Oh I would love to see the look on their face! If I would have asked this question when my boys were boys … I’m sure they would have rolled their own eyes and made some comment about me being a dork 😉 But I would ask them anyway … it’s my job to bug them! 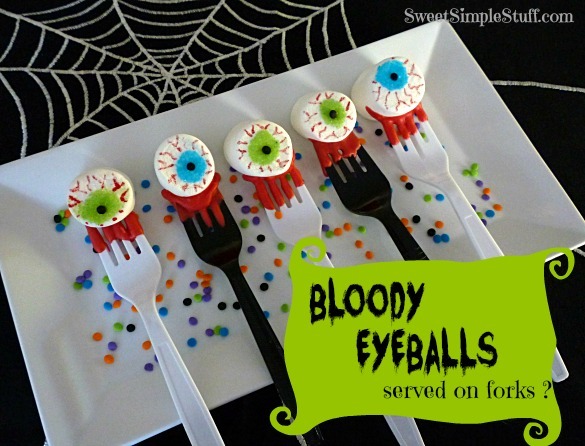 Anyway … bloodshot marshmallow eyeballs on a fork are great as pops or hot cocoa stirrers and sooooo easy peasy to make! 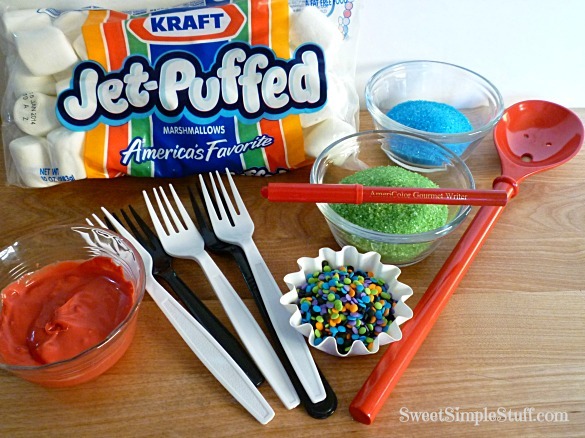 Dip tines of fork in melted candy, tap fork if you have too much candy. Stick marshmallow on fork. Let sit for a few minutes to let candy harden. Dip the tip of spoon handle in water, tap off excess (you want it to be wet, but not dripping) and place it on marshmallow. Sprinkle sugar on wet spot, pour off excess. 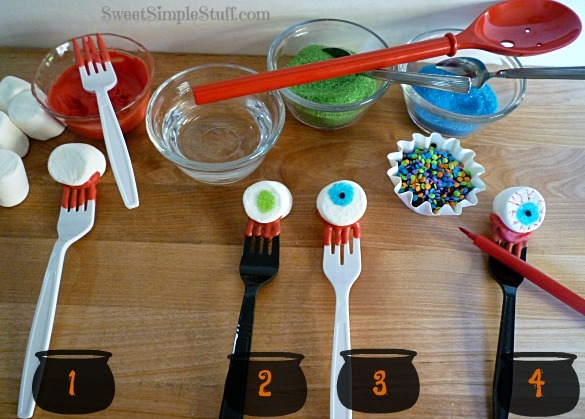 Immediately place and press a black confetti in the center of the sugar. 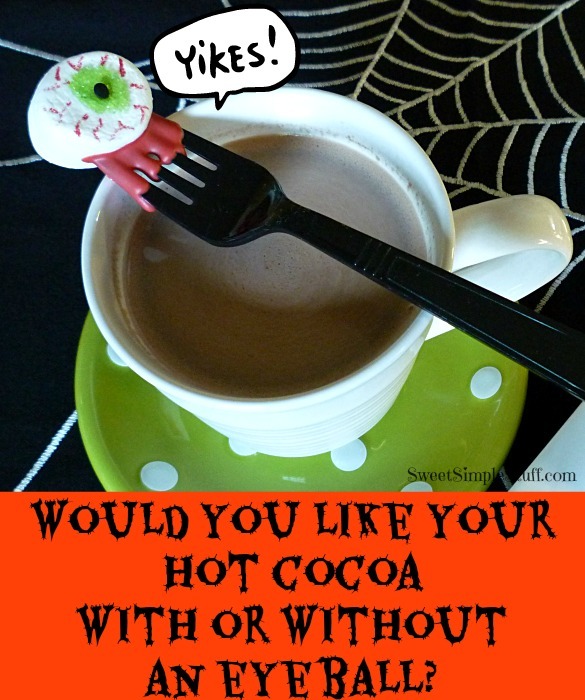 I look forward to your comments … do you like your cocoa with eyeballs? Wowzers! Awesome and yikes at the same time!!! I don’t know how you get your ideas, but I love this! Thank you Lucinda :). I have no explanation for my mind! 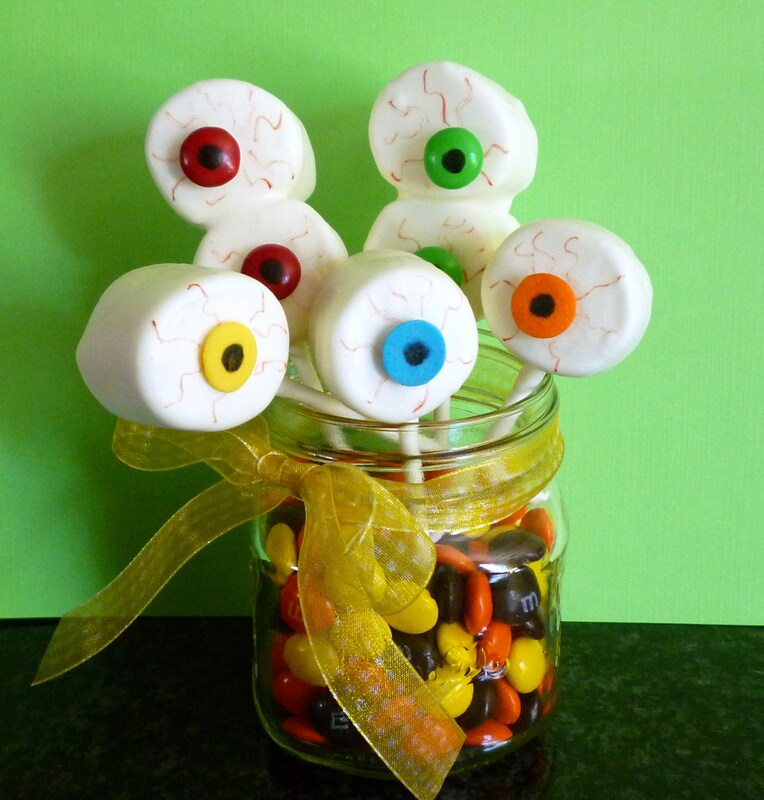 My eyes look like that right now!!! 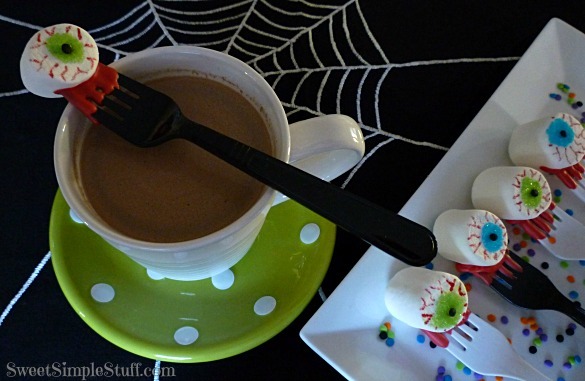 Great fun way to celebrate Halloween with hot cocoa and marshmallows. I remember when living in the States it was always very cold and the kids need to warm up after all that trick or treating. Brenda, these are awesome. I wouldn’t dare make them for my grandsons. They were freaked out by my bloody finger cookies. He-he-he, happy Halloween.